If you're looking for a reputable and honest auto shop in the Phoenix area, check out one of these Bumper to Bumper Radio Preferred Auto Shops listed below. We stand by each of these shops because of their quality work, customer reviews, and their outstanding commitment to quality auto repair work! Representing the best in family operated auto repair shops in phoenix, Shadow Mountain Auto Service is a facility that is profoundly centered on making sure that their customers receive the best auto repair in phoenix. They understand that every situation is different and we take steps to make sure that the solution is tailor made to you and your vehicle. Tanner Motors is the Volvo specialist in Phoenix, and is arguably the best independent shop for Volvo repair in the state. Though Tanner motors opened their door about a decade ago, the tanner family has been serving Arizona drivers since 1945. Virginia Auto Service is an award-winning independent auto repair shop located in the heart of Central Phoenix, Arizona. They have been providing top quality auto repair services in downtown Phoenix for over 22 years. 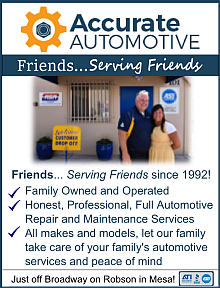 Dave’s Car Care, Glendale AZ has been your automotive repair center for trusted service for over 37 years. As a family owned and operated business, we understand the necessity for individual attention to the needs of our customers. After 43 years in business, it’s no surprise that Larry Harkers Auto Repair in Phoenix AZ is still going strong. Its a rare thing to see a business of any sort stand the test of time, let alone a maintenance garage of humble origins. First Class Auto Body is your number one Scottsdale AZ collision center. By providing the full spectrum of auto body work, we are able to serve our customers to the fullest extent. This is important to them because they feel that every driver deserves to have an automotive shop they can trust. Arizona Driveshaft and Differential is your center for professional driveshaft and differential repair in Mesa, AZ. We take price in consistently performing above the expectations of our customers in quality labor, professional attitude and service to our patrons. Desert Car Care is your local auto repair shop in Chandler, AZ. We understand that your vehicle is an important part of your daily life, and pledge to treat you and your car with the respect you deserve. 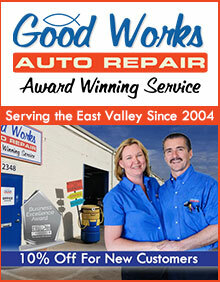 Good Works Auto Repair, Tempe AZ is the number one choice for fair priced, quality and efficient vehicle maintenance. Centrally located in Tempe at the 101 and Broadway, Good Works Auto Repair helps to keep engines healthy with a focus on preventive maintenance. 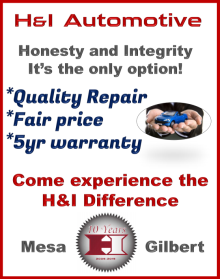 Since 2009, H & I Automotive in Gilbert, AZ has provided the region with top-quality automotive repairs and detailing. They dedicate themselves to providing the best service at affordable rates for all makes and models of vehicles. Since 2009, H & I Automotive in Mesa, AZ has provided the region with top-quality automotive repairs and detailing. They dedicate themselves to providing the best service at affordable rates for all makes and models of vehicles. Family Owned and Operated for over 20 years, Mesa Auto Works has built a tradition of quality auto maintenance in Mesa, AZ. We work hard to achieve personal understanding with every customer regardless of large the business turns out to be. Welcome to Tri-City Auto Repair, a family-owned auto repair shop in Tempe, Arizona, for over 45 years. Tri-City Auto Repair provides complete auto repair in Tempe, Arizona including brake service, leak diagnosis, car tune-ups, radiator repair, and more.